If you fail back from a VM replica to the VM in the original location, you can instruct Veeam Backup & Replication to perform quick rollback. Quick rollback significantly reduces the failback time and has little impact on the production environment. During failback with the quick rollback option enabled, Veeam Backup & Replication does not calculate digests for entire VM replica disks to get the difference between the original VM and VM replica. Instead, it queries CBT to get information about disk sectors that have changed, and calculates digests only for these disk sectors. As a result, digest calculation is performed much faster. After that, Veeam Backup & Replication performs failback in a regular way: transport changed blocks to the original VM, powers off the VM replica and synchronizes the original VM with the VM replica once again. It is recommended that you use quick rollback if you fail back to the original VM after a problem that has occurred at the level of the guest OS of the VM replica — for example, there has been an application error or a user has accidentally deleted a file on the VM replica guest OS. Do not use quick rollback if the problem has occurred at the VM hardware level, storage level or due to a power loss. 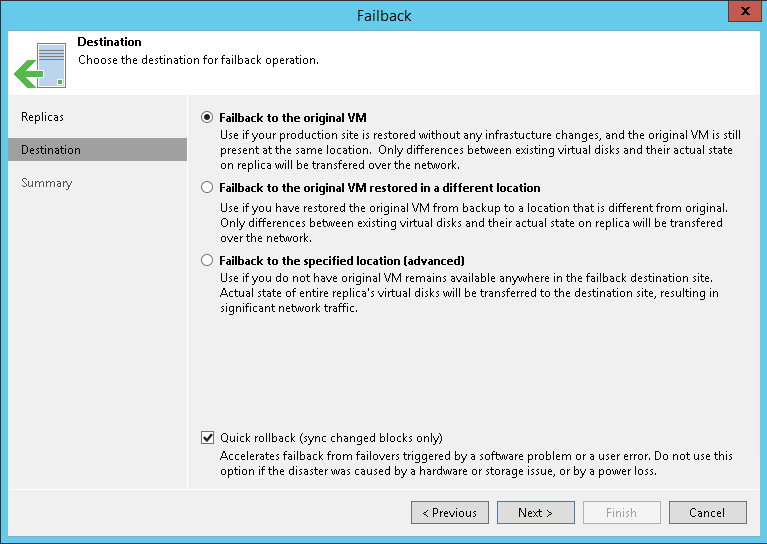 You must perform failback to the VM in the original location. The VM replica must be created with the Use changed block tracking data option enabled. After you fail back to the original VM with quick rollback, the CBT on the original VM is reset. During the subsequent replication job session, Veeam Backup & Replication will read data of the entire original VM. Quick rollback is not supported for VM replicas created with legacy replication jobs.